Institute of Human Brain, Russian Academy of Sciences, St. Petersburg, Russia. International Academy of Human Development, Moscow, Russia. International Academy of human Sciences, St. Petersburg, Russia. 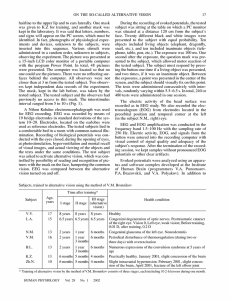 Originální abstrakt: In this work, we present the first results of the study of the so-called alternative or direct vision of sighted and weakly-sighted subjects and the related brain activity. 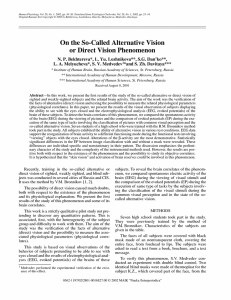 The aim of the work was the verification of the facts of alternative (direct) vision and testing the possibility to measure the related physiological parameters (physiological correlates). 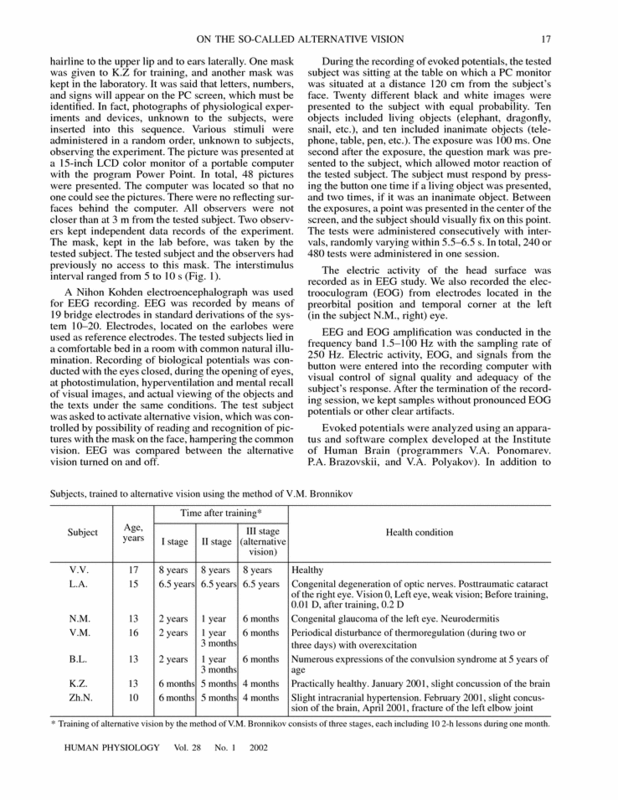 In this paper, we present the results of the visual observation of subjects displaying the ability to see with the eyes closed and the electrophysiological analysis (EEG, evoked potentials) of the brain of these subjects. To detect the brain correlates of this phenomenon, we compared the spontaneous activity of the brain (EEG) during the viewing of pictures and the comparison of evoked potentials (EP) during the execution of the same type of tasks involving the classification of pictures with common visual perception and the so-called alternative vision. Seven students of a high school who were trained with the B.M. Bronnikov method took part in the study. 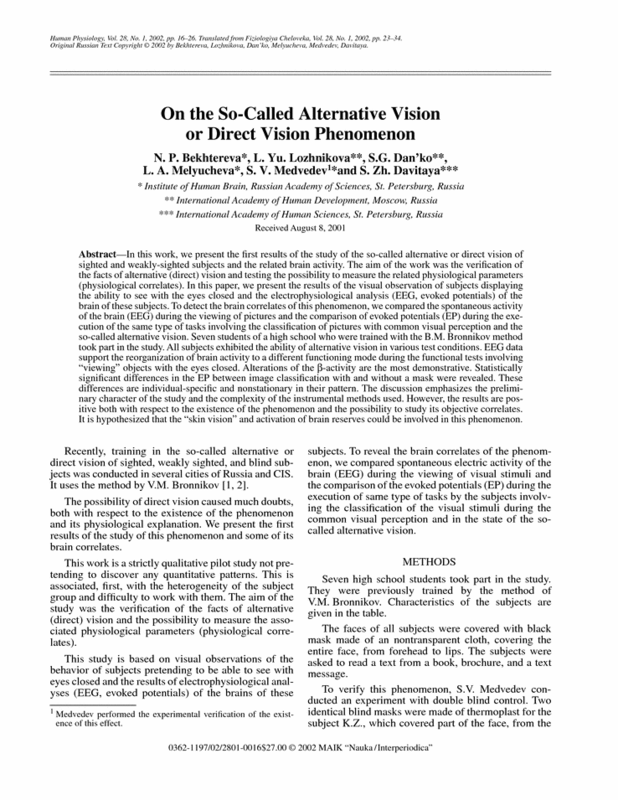 All subjects exhibited the ability of alternative vision in various test conditions. EEG data support the reorganization of brain activity to a different functioning mode during the functional tests involving “viewing” objects with the eyes closed. Alterations of the β-activity are the most demonstrative. Statistically significant differences in the EP between image classification with and without a mask were revealed. These differences are individual-specific and nonstationary in their pattern. The discussion emphasizes the preliminary character of the study and the complexity of the instrumental methods used. However, the results are positive both with respect to the existence of the phenomenon and the possibility to study its objective correlates. It is hypothesized that the “skin vision” and activation of brain reserves could be involved in this phenomenon. Share the post "Studium fenoménu tzv. přímého či alternativního vidění"